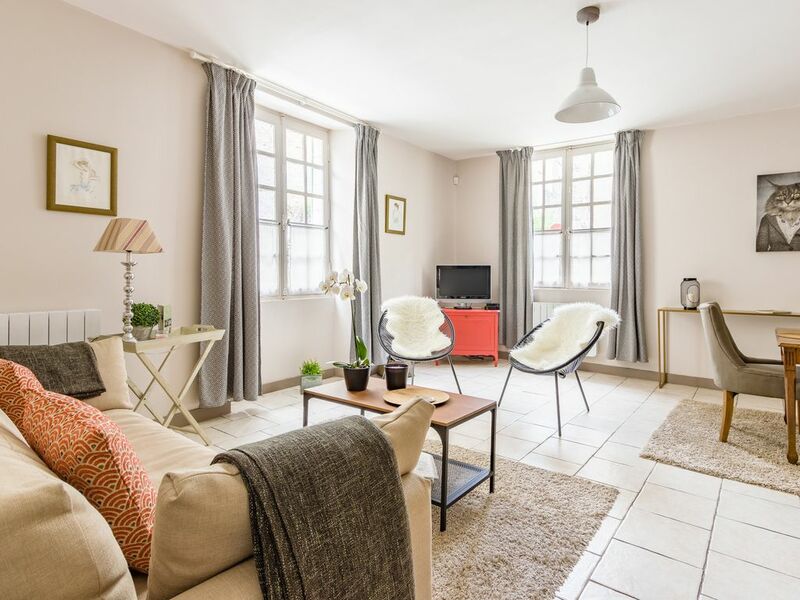 The apartment is in Villaconcorde, a town house located in the very heart of Amboise, in a quiet street, rue de la Concorde, renowned as the most elegant of Amboise. Villaconcorde, is a 17th century house which has been restored, respecting the charm and authenticity of this historical house, totally dedicated to rental holiday places, with three other apartments with different size. That is the usual comment of our guests when they arrive ! It's in fact difficult to put it in words but you are virtually at the very door of the Royal Castle, which used to be connected with the house by underground passage 350 years ago... Not just 'a view on the castle' but the feeling that you belong to its history. A warm welcome is guaranteed by Karine and Thierry, or member of their team, who speak English, and will be pleased to help you to prepare your stay. The apartment very bright and sunny on the ground floor, boasts a fully equipped kitchen including microwave and dishwasher, Nespreso, coffee machine, a cosy bedroom with a double bed (160X190cm) a large living room with a flat screen TV, a DVD player. * New kitchen, fully equipped for self-catering. * High quality of refurbishment. * Exceptional location right in the heart of Amboise. * WIFI- Free internet access provided. * We speak English, Italian and Spanish. * Private Cooking Class with our Chef. Travel agency at a special price. * Transfer from Paris/CDG airport. Villaconcorde also offers 3 other apartments with different size listed in VRBO or in our website. Keywords: Rental Apartment, Historical townhouse, centre of Amboise, Loire Valley, Luxury and cosy apartment. Karine and Thierry are originated from Amboise but spent a few years in London before returning to their home place. They wanted to share their passion for the Loire Valley, and in 2002, they seized the opportunity to buy a 17th century townhouse in the most renowned street of Amboise, rue de la Concorde, directly facing the Royal Castle. Karine is an interior designer and carefully renovated the Villa mixing tradition, charm and authenticity, without any compromise on comfort and equipment. Thierry is the owner and manager of a Travel Agency," Riverloire" specialized in organizing “a la carte” tours in the Loire Valley. 'Wow ... I didn't realize Villaconcorde was so close to the castle !' is the usual comment of our guests when they arrive. It's in fact difficult to put it in words but you are virtually at the very door of the Royal Castle, which used to be connected with the house by underground passage 350 years ago...Not just 'a view on the castle' but the feeling that you belong to its history. Because of its prime location, VillaConcorde will allow you to just walk to some of the main attractions such as the Château Amboise (of course !) but also Clos Lucé, the last residence of Leonardo da Vinci, and many other places... You will also appreciate the walking distance to the pedestrian streets, excellent restaurants, numerous cafés, boutiques and the local products market. Picnic basket and outdoor chairs. Well located, beautifully decorated , perfectly clean, very comfortable. Kitchen and bath well done. The apartment was lovely--just like the pictures--close to everything, clean, charming, spacious. Karine and Thierry were excellent hosts--easy to get in touch with, accommodating. We were thrilled with the wines they suggested and would definitely stay here again! Location, Location, Location - Charming Stay!!! First of all our host, Karine as wonderful. We had a little trouble finding the apartment and she patiently guided us to the right spot. Upon arrival, Karine took great care to explain all workings of the apartment and where various businesses were located (super market, restaurants) My wife and I stayed in the 1 bedroom ground floor apartment at Villaconcorde as a gift from my colleagues in the US and they couldn't have picked a better apartment for us. The Villaconcorde is located literally at the base of Chateau Amboise which gives a great old charm feel to the stay. On the opposite side of the Chateau is the entrance along a quaint street with a number of restaurants and shops. We loved everything about our stay - Karine was the best, the location can't be beat, the apartment is quaint, clean and well equipped, and the Chateau is a fabulous for an afternoon visit!!!! Six of stayed in the "penthouse" apartment at Villaconcorde. Great location. Castle Amboise is directly across the street! Great view and convenience to both the castle and the rest that Amboise has to offer (which is considerable)! Living area, kitchen and downstairs bathrooms are very nice. There is only one negative: The "loft" bedroom and bathroom are attractive, but the low, slanted ceilings are a challenge for people who aren't very short. That room might be best for children about age 6 to teens. The owner was very friendly and helpful in arranging taxis for us. The wine they have available is excellent! My husband and I stayed in the apt for 3 nights in August. Although it was during the heatwave, we were able to stay relatively cool with the help of fan. I don't think that this would be an issue at other times of the year. The apartment is clean, well-equipped, quiet and is in a great location right beside the castle. Free parking is available on the street if you can find a spot but we used the town parking which was a short walk. Not much of an issue for us. Very convenient to the restaurants and shopping. We attended the market in town where you can buy anything from roast chicken to furniture. Would highly recommend the apt. My wife and I had a very enjoyable stay in this apartment, which is especially suitable for couples. The apartment is on a quiet street with ample and safe street parking. It is within minutes of walk of rue Nationale and rue Victor Hugo as well as a Carrefour market. Claire was waiting for us at the scheduled check-in time, and she made for us dinner reservations at Michelin starred restaurants both of which are just a few miles away. We’d stay there again if we return to Loire Valley in the future. Secured payment with Société Générale our bank by link As we run our own company, RiverLoire, a travel agency, the easiest payment is to use the secured Visa/Mastercard payment. We will send you a secure payment website by email. We accept CB/ MasterCard /VISA, bank transfer, and cash.